The Riviera Nayarit Convention and Visitors Bureau is pleased to share the events programed for April 2015. 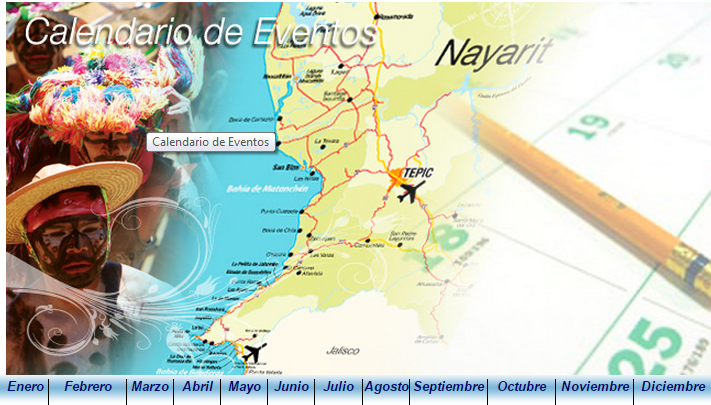 For the Riviera Nayarit Yearly Event Calendar click http://www.rivieranayarit.com.mx/calendario_de_eventos. The Electric Beach Festival is free for everyone and takes over the Sunset Garden at the Hard Rock Hotel Vallarta on Friday, March 3rd and Saturday, March 4th from 10 a.m. to 8 p.m. both days. The Oyster Festival has a 12-year history and happens on the El Punto beach in Bucerías. It’s organized by the co-op of fish producers and acquaculture fishing entities of Chila, Peñita and Boca Ameca. The event program includes a historical look at Bucerías and the local oyster. It’s open to the public and all are welcome to savor the local oysters and enjoy the music and the traditional verbena. The Plaza de Rincón de Guayabitos in the Riviera Nayarit is transformed into a playground for hundreds of Volkswagen vehicles from all over the Mexican Republic, most of them the traditional bugs and combies, which have been jazzed up to show off and strut their stuff in this expo for lovers of these classic cars. For more event information click https://www.facebook.com/fbtpcbugs. The Riviera Nayarit is ready to party to the Latin rhythms of the Salsa Mambo Fest 2015, a series of presentations and dance classes with the experts, as well as a fabulous concert and plenty of fun. The event takes place at the Marival Resorts & Suites in Nuevo Vallarta. Reserve your spot at http://www.salsamambofest.com/. The Annual Open Water Competition is turning into a tradition in the waters of La Cruz de Huanacaxtle. Hundreds of swimmers from around Mexico meet to compete, from the littlest ones to the most tested veterans. Categories include Child, Youth, Master, Special Needs and Professional. More details at http://www.nadoseguro.com/. This bicycle race is divided into two competitions: 150km for the Gran Fondo and 75km for the Medio Fondo. The tour begins in Nuevo Vallarta, continuing on through Sayulita, along the coasts of Punta de Mita and La Cruz de Huanacaxtle, through the incredible landscapes of Fortuna de Vallejo ending in Bucerías. More info: http://bicibucerias.com/gran-fondo. Children and teens can put their fishing abilities to the test in La Cruz de Huanacaxtle, the Nautical Capital of the Riviera Nayarit, where they will have the opportunity to enjoy this activity where the fishing is best. To make it even more special, there are prizes for the top anglers. Punta Mita, Mexico’s most exclusive tourism development located on the Riviera Nayarit’s Glamour Peninsula, offers three days of extraordinary culinary experiences along with a two-day golf tournament on the exquisite Pacífico and Bahía golf courses. The event was created to pair the best wines and local and international dishes with the best golfers and chefs. Find all the details here: http://puntamitagourmetgolf.com/es/. This annual competition takes place in Sayulita, the Surf Capital of the Riviera Nayarit, offering a unique—and free—opportunity for kids and teens looking to become the newest champions in the world of surf.